Demand for minerals that are key ingredients in consumer electronics products continues to fuel conflict and crimes against humanity in eastern Congo. In this latest paper from the Enough Project and our partner, the Grassroots Reconciliation Group, we describe the link between the violence in eastern Congo, the mining and trade of key minerals, and the electronics corporations that are the largest end-users of these natural resources. Building off of John Prendergast’s recent report, “Can You Hear Congo Now?,” this paper describes how a comprehensive approach must be taken to transform Congo’s mineral resources from a key source of funding curse for armed groups into an engine of empowerment for Congolese civilians who have been victims to the conflict and are dependent upon the meager livelihoods they earn in the mines. The majority of violence in eastern Congo has been carried out in mineral-rich areas of the eastern provinces. The same armed groups that reap enormous profits from the mineral trade in eastern Congo regularly commit conscience-shocking atrocities as they jockey to control the region’s most valuable mines. Largely beyond the authority of the Congolese government, armed groups who perpetrate violence against innocent civilians control these areas and directly profit from the trade in mineral ore. The four most profitable ores produce the metals tin, tantalum and tungsten—the 3T’s— and gold, which together generate as much as $183 million annually for armed groups. These armed groups force miners to work in desperate, dangerous conditions for an average of $1-$5 a day. Without alternative sources of income, these miners and their families remain virtually enslaved to armed groups and the conflict minerals trade. Why are current efforts falling short? So far, efforts to address this conflict by the international community, the Congolese government and Congo’s neighboring states have been largely reactive and incommensurate to the scale of the problem. The international community spends billions of dollars on elections and peacekeeping in Congo but continue to ignore the primary economic driver of the conflict. There has been no a coherent approach to alter the incentive structures of Congo’s conflict mineral trade and its devastating impact in helping to keep Congo’s institutions weak and dysfunctional. The Congolese government lacks the capacity and political will to combat corruption and legitimize their mineral wealth, and Congo’s neighbors—including Rwanda and Uganda—have often encouraged continued instability in Congo because they also profit from the illicit trade. A renewed cooperative approach between Congo and its neighbors in establishing legitimate trading mechanisms could offer the best prospects of a long-term solution. Shining a light on the supply chain. Push electronics companies— the principal end-users of the 3T’s and gold—to change the way they practice business by working together with their suppliers to create a tracing system paired with credible monitoring of the system by independent third parties. This would provide a critical step towards demanding greater accountability for corporate behavior and transparency. With 80 percent of consumer electronics companies trading on U.S. stock markets, U.S.-based activists have some of the most powerful opportunities for leverage on this part of the supply chain. Identifying and securing strategic mines. The United Nations should collaborate with the Congolese government identify key mining sites under the control of armed groups. Properly integrated Congolese security forces, supported by U.N. peacekeepers, should secure these sites and transit routes. This approach must be grounded in a more comprehensive and coherent effort to advance broad security sector reform in Congo. Reforming governance. The international community should work hand in hand with the Congolese government to force the will and capacity to exercise control over mining and commerce in eastern Congo. With Congo sorely in need of international funds, there is an opportunity to press for not just commitments but demonstrable reforms to the regulation of mining, commerce, and taxation. Supporting livelihoods and economic opportunities for miners. Impoverished Congolese miners and their families are dependent upon their meager incomes and have few viable economic alternatives. Efforts to end the trade in conflict minerals absolutely must be accompanied by international support for livelihoods and economic opportunities in eastern Congo. This should include legal reform, and investments in both infrastructure as well as alternative livelihoods such as agriculture and manufacturing. The sooner the illicit conflict minerals trade is eliminated; the sooner the people of Congo will actually enjoy the benefits from their own resources. 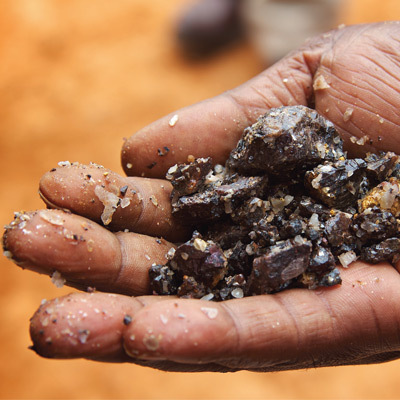 Congo’s conflict minerals problem is complex, but the roadmap to a solution exists. The four key parts of this strategy— a transparent supply chain, securing mine sites, improved governance of mining and trade, and improved livelihood options for miners— are all realistic policy goals. But efforts won’t succeed unless individual consumers in the United States and around the world step up and demand a change. By demanding transparency and accountability from the world’s largest electronics companies, consumers can fundamentally change the logic of Congo’s conflict and end the scourge of conflict minerals. Call the White House comment line at (202) 456-1111 and urge President Barack Obama to appoint a Special Envoy to the Great Lakes region. Call the Capitol Hill switchboard at (202) 224-3121 to connect with your legislators’ offices and urge them to join the Congressional African Great Lakes Caucus.